Samsung revamped its camera UI and software. The old S Voice shortcut - double tapping the Home key - now launches the camera and there's almost no delay. No more missed shots because the camera app was loading. Unlike the Galaxy Note Edge, this time the camera controls are identical to the ones on a flat screen. That means the shutter is in the middle of the right column of the screen instead of on the curved part of the display. Shooting modes are still the focus, but manual controls are available on-screen that you can tune and get a live feedback. That's the Pro mode which offers focus control, ISO, exposure compensation and white balance adjustments. You can save settings you use often as presets. The main camera, of course, has HDR but Samsung has added the option for HDR selfies too. This will improve photos where the sun is behind your back. There's an auto mode that will save you the trouble of activating and disabling the mode manually. A new mode is Virtual shot. Basically, you move the _phone_ around while keeping your subject centered. After that the _phone_ uses its accelerometers to show you different angles of the subject as you rotate the phone. This is available on both the main and the front-facing camera so you can take a Virtual shot of your face. 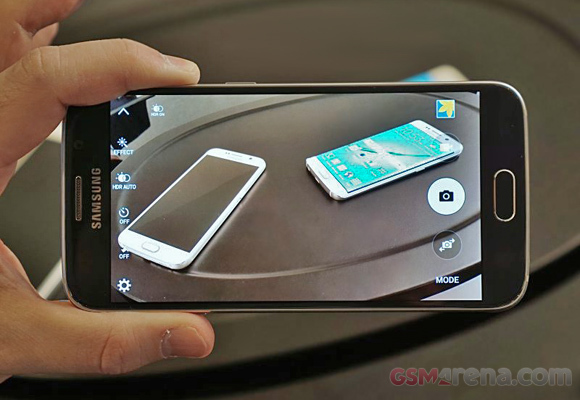 Those aren't the only shooting modes, in fact the Samsung Galaxy S6 edge camera lets you download new ones. There are only two available at the moment, the familiar Sound & shot and Sports shot (you have to download those manually if you use them). There's tracking autofocus available - it keeps the focus point on a subject even if it moves around. This makes sure most of your photos will be in focus. First up, a photo we took just outside the Palau Nacional on Montjuic. Both phones chose different focus points, but we picked a representative part of the image. It was a nice and sunny day so both phones shot at ISO 40, though the Galaxy S6 edge typically went for faster shutter speeds thanks to its wider aperture that lets more light in. Both phones achieved captured roughly the same amount of detail. The Galaxy S6 edge photos have less noise in them. The new phone also applies less saturation to colors, though they can now appear a little muted if you are used to Samsung's usual lively colors. Another photo was taken just outside the Fira de Barcelona (the ex-MWC venue), looking back towards Palau Nacional. 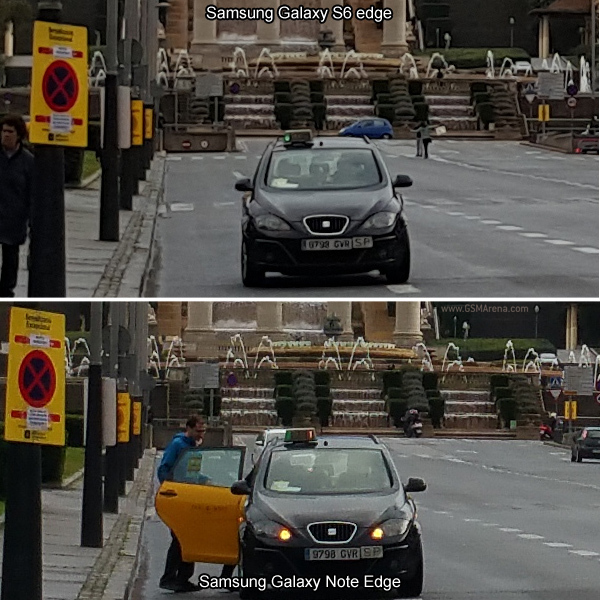 It's the same story in terms of settings ISO 40 and faster shutter speed for the Samsung Galaxy S6 edge. From this photo it's pretty clear that S6 edge camera has a wider angle lens and fits more into the frame. This leaves fewer pixels for each object of the scene and gives the Galaxy Note Edge a leg up. 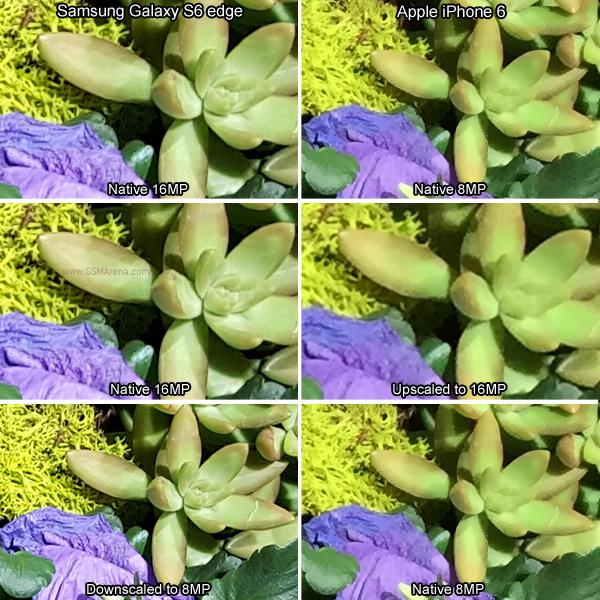 We confirm the findings from the previous photo - less noise and color saturation for the S6 edge. Looking at trees, the new flagship shows an advantage in processing. The Note Edge often renders foliage as if drawn with a brush and paints, a side-effect of the noise reduction (and there's still visible noise!). Trees look much more natural in Galaxy S6 edge photos. We snapped a few macro shots and were impressed by how well the Samsung Galaxy S6 edge creates a bokeh effect. Out of focus elements look softly blurred, while the Galaxy Note Edge camera create a mix of blur and smudging from the noise reduction. We also snuck in a photo to compare the Galaxy S6 edge with the Apple iPhone 6. Those two are difficult to compare - 16MP vs. 8MP and quite different aspect ratios. We looked at the photos as they are, but also tried upscaling the iPhone 6 photo to 16MP and then downscaling the Samsung photo to 8MP. The iPhone 6 does an admirable job, but its camera resolution is starting to show its age. The Galaxy S6 edge captured more of the leaf texture, the wrinkles in the dried petal. The difference is perhaps most visible in the moss. In the Samsung photo each strand of the moss is separate while on the iPhone's photo they start to merge visually. As an overall impression, the Galaxy S6 edge produces beautiful photos, especially with the smooth blur it introduces in out of focus areas. We noticed that it prefers to keep the focus point close by, things in the distance typically start to soften - but that may as well be the pre-production unit we used for the test. The reduced noise compared to the Galaxy Note Edge is a good improvement, but owners of the curved screen phablet should remain happy with their camera. Samsung has one of the best panorama software around and we wanted to see if it has improved since the Galaxy Note Edge. Both cameras produce stunning resolution - the final image is over 3,000px tall and wide enough to complete a full 360° circle. There are tons of detail in each shot and no stitching issues, especially when there's nothing moving. 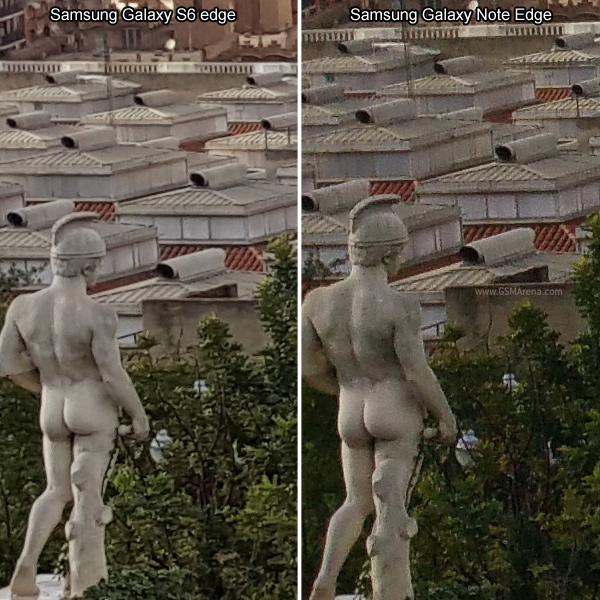 The Galaxy Note Edge carries the stronger saturation from the still camera into its panorama. The Galaxy S6 edge once again does a better job in rendering foliage. Both Galaxy Edge devices shoot video up to 2160p at 30fps. Both use 48Mbps total bitrate and record quality stereo audio at 256Kbps bitrate and 48kHz sampling rate. You can watch the two videos below - we shot them simultaneously - but for a quick comparison we made a crop. The Galaxy S6 edge camera again captures a bit more of the scene, it has a wider lens. 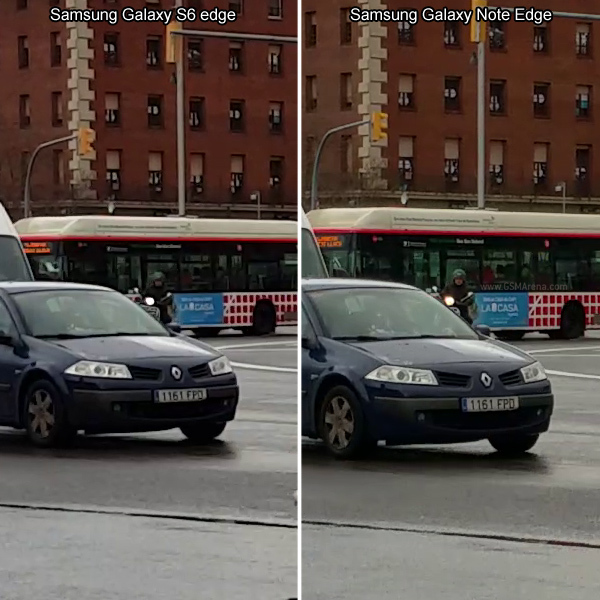 The Samsung Galaxy S6 edge video appears slightly sharper and the compression is smoother, the Galaxy Note Edge shows traces of compression artifacts. 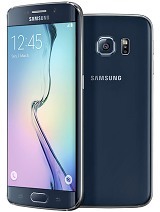 The Samsung Galaxy S6 and S6 edge brings optical image stabilization (OIS), which debuted on the Galaxy Note 4. The S6 duo also has digital stabilization that can be used in conjunction with OIS to make videos even smoother. You can disable the digital stabilization, but the optical one is always on. There are two times when the digital stabilization is forced off - when shooting 2160p or when using the tracking autofocus. You may remember we already shot this setup, but we returned for seconds. With OIS only the up/down wobbling motion caused by is still visible. Enabling digital stabilization dampens this movement and leaves only a very slight floating motion. With the improved capabilities of both the camera and the chipset, adding a manual controls mode is welcome too. HTC already has one even if it didn't have a camera to make proper use of it, the Lumia Camera on Windows phone has been peddling manual controls as a key feature for a few years now. And the camera's capabilities have indeed improved since the Galaxy Note 4/Edge. The new one gets more light and a shallower depth of field from the wider aperture and the processing has improved. Photos have less noise and foliage among other things looks much better. The soft bokeh that's possible now is highly impressive. Video recording shows incremental improvement though we haven't tested all video modes, to see if those all-important high framerate modes have gotten better. The Samsung Galaxy S6 edge (and its flat-screened twin) has a solid claim for the title of best mobile camera. It's certainly one of the friendliest with refined image processing and features to suit both casual users and enthusiast photographers. A new mode is Virtual shot. Basically, you move the phone around while keeping your subject centered. After that the phone uses its accelerometers to show you different angles of the subject as you rotate the phone. This is available on both the main and the front-facing camera so you can take a Virtual shot of your face.